How much do you know about the leaders of the largest companies in the UK? How are they interconnected? What are their philanthropic interests? And those of their fellow directors or the companies that they lead? Whilst much information is available in the public domain concerning corporate giving by the FTSE100, limited information is easily available concerning the philanthropic activities of their board directors. Factary’s new report provides in-depth research into each of the 94 Chairmen – and women – of the FTSE100, including biographical information, key professional and philanthropic interests and details of links to other FTSE100 Chairmen. We also provide a brief overview of each company and their CSR activities, including known major gifts, together with details of a further 189 notable board directors from the 100 companies. The report highlights that the vast majority of FTSE100 Chairmen are philanthropically active, with over 94% providing money, time and expertise to support a wide variety of causes across the UK and internationally. The most popular causes receiving support are education, arts and heritage but with an average of 2.9 causes supported by each Chairman there is also evidence of support for environment, sport and disability services. There is a notable is difference between the chosen philanthropic interests of individual Chairmen and those of the companies they head up, which are more likely to support health, welfare, children and international development. The philanthropic interests of the companies and the people behind them are further detailed in an Excel spreadsheet, accompanying the full report, which contains a breakdown of all identified philanthropic interests which can be filtered to focus on specific companies, Chairmen or directors. The report also shines a light on how the FTSE100 Chairmen interconnect through professional and philanthropic involvements, educational institutions and club memberships. The report shows that 70% of the FTSE100 Chairmen connect directly to at least two other Chairmen, highlighting that there is significant potential for networking and relationship building within this group. We present this network information in the form of an interactive, online Factary Atom map, access to which is included with the report. If you are about to launch a major campaign, or just want to see who your key volunteers may know and what their interests are, then this latest report from Factary will be an invaluable resource for major donor and corporate fundraisers or prospect researchers – providing you with detailed and up-to-date information on some of the most high profile and well-connected philanthropists in the UK. If you are interested in ordering a copy or would like more information, please email research@factary.com or call 0117 916 6740. This happened because a dedicated group of professionals managed a process that led to the alumna being asked for a very large philanthropic gift. At the heart of that process was, and is, the prospect research team. The team used – like we all do – public domain information to identify and understand potential supporters. So perhaps we cannot use public domain information to identify and understand potential supporters. But think for a moment. Why do I have my profile in LinkedIn? What is my ‘purpose’? Is it just a marketing tool, showing potential clients what a clever chap I am? No! I had all sorts of purposes in mind when I created my profile in LinkedIn. I wanted to reassure clients that I was, and am, a decent person. I am proud of what I have done and wanted – sorry folks, this gets personal – to boast a wee bit about setting up Factary, about the books I have written and the languages I speak. I wanted access to the profiles of other people with whom I might work or even play. I wanted to explain who I am and how I got here – it’s cathartic. And I wanted a useful depository for my lifeline – to remind me of exactly when I went to school or which year I started in fundraising. The person who has her biography in Who’s Who, or who gives a personal interview in the Times, or who is listed as the director of a company, or as the trustee of a charitable foundation has the same wide range of expectations. The ‘purpose’ of a personal interview in the Times is to sell advertising space on the facing page of the newspaper; “All the papers that matter live off their advertisements,” said George Orwell, in Why I Write*. But that is not the ‘purpose’ that the interviewee had in mind when she was approached by the journalist. Nor is it the ‘expectation’ of the interviewee. She knows, when she agrees to give the interview, that her warts-and-all will be exposed to public view. She expects that she will receive praise, opprobrium, investor pitches, car sales teams and an approach from a headhunter as the result of her interview. So here again, at Companies House, we have a variety of purposes for information in the public domain. It is right and proper that prospect researchers use Companies House information to establish the “real history” of “men of importance and property”, and, 172 years after Mr Gladstone’s speech, of women of importance and property too. All the universities that are engaged in raising funds, along with our theatres, museums and charities, manage a process that results in high-value philanthropy. At the heart of that managed process is prospect research. And alongside every prospect researcher is public domain information. People in the public domain – in Who’s Who, or LinkedIn, the Times or Companies House – are there for a variety of ‘purposes.’ They expect that the information will be used in a variety of ways – including, yes, by people who will lead them into great philanthropic acts. We prospect researchers do great works with public domain information. It is wholly legitimate that we use public domain information for this purpose. We must defend our right to do so. 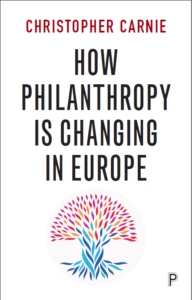 Chris Carnie is the author of “How Philanthropy is Changing in Europe”, published by Policy Press in January 2017. He writes in a personal capacity. The ICO fines for BHF and RSPCA that were announced this week have caused understandable concern for prospect researchers and wider fundraising teams across the sector. This blog post is Factary’s initial response to this news. The ICO has so far issued two statements about the fines levied (these can be seen here and here). The statements outline that the fines are being issued for various infringements of the Data Protection Act through wealth screening, data appending and data sharing. To be clear, this blog post refers only to the situation with wealth screening, or, as we call it, Database Screening. Data appending and data sharing of bulk data are not services we provide at Factary so we won’t comment on the situation with these fines. Can we still carry out Database Screenings? It seems that one of the main reasons for the fines levied for ‘wealth screenings’, as explained in the information we have seen from the ICO so far, was because “Donors were not informed of these [Screening] practices, and so were unable to consent or object” to them. The lesson here is not that Screening is unlawful from the ICO’s viewpoint, but that non-profits and Screening service providers need to be open and transparent about what they will use personal data for. This is something that we mentioned in our previous blog on data protection. The problem still remains, of course, that we feel neither the ICO nor the Fundraising Regulator have been too clear on how this information should be presented to supporters or indeed what information is necessary / sufficient. Hopefully they will do more to educate the sector and provide greater clarity. In the meantime we would expect that the vast majority of non-profits have completed and published, or are working on, improved privacy notices that include information about prospect research so that their supporters are fully aware of what their data is used for. The RiF ‘data protection working group’ will be drawing together samples of these, and this is something Factary will be helping with. We’ll post news on this here on the blog, on our Twitter feed and the RiF committee will also post on their Twitter feed, so keep an eye out. If you’d like to discuss privacy notices or statements please do email me. Either way, there is very little you can do about previous Screenings; you can really only make sure you are fully prepared and compliant for the next. From our point of view, some of the ICO’s latest statements set a tone which portrays Screening (and prospect research more generally) negatively. The ICO statements said, “The millions of people who give their time and money to benefit good causes…will be upset to discover that charities abused their trust to target them for even more money”. This kind of reporting will no doubt result in harmful press articles (aside from the inevitable articles from the Daily Mail which I won’t reference here) such as the BBC and even Third Sector where they have reported negatively that charities are “secretly screening donors” with a “disregard for people’s privacy”. We feel the general tone used to report on these fines suggests a lack of understanding of what Screening is and why it is used – and, by extension, what prospect research is and what it is for. We should, as a sector, take some responsibility for this as we have not historically been very open in explaining how Screening and prospect research benefits donors and helps to improve their relationships with the causes they support. That said, we can’t shoulder all the blame, as many people I have spoken to have found the ICO’s approach to communication on these issues (and when directly speaking at conferences during 2016) to also be quite negative. For example, many of the emails I have received since Tuesday start with, “One of my trustees has read the Daily Mail article…” or, “Our compliance team has seen the ICO report…”, followed by concerned questions about the legality of Screening / research. This highlights that the negative and sometimes misleading reports that are in the public domain are already having a troubling impact on our abilities to carry out the normal functions of prospect research. We understand the genuine reasons for the ICO’s actions, but it serves no purpose to paint a negative image of the sector, who largely do incredible work for people and society. This means it is up to us push back on the negativity and educate our supporters, the wider public and even (in some instances) our own colleagues about prospect research. This echoes what was said at the RiF Conference; we need to take ownership of communicating the need, impact and benefits of prospect research through privacy statements, protocol and policies. We need to be positive in our communication and underline the benefits to donors and non-profits of prospect research – and, to highlight the negative consequences of fundraising without prospect research. As ever, if anyone has any questions on this please do not hesitate to contact me at nicolaw@factary.com. We would also like to take this opportunity to thank many of our colleagues and friends from the sector who have contacted us with messages of support in the past 48 hours – we really appreciate it!